For some people, finding the shortest line at the grocery store is a small victory. For others, it’s getting out of line altogether. And for those who want to get off the grocery-store grid entirely, Massachusetts is the place to do it. “We’re one of the top direct-to-consumer sales states. I’m dead serious, we’re good at this,” says Amy Mahler of the Massachusetts Department of Agriculture. “People really respond to knowing where their food comes from, and farmers are being more innovative about putting their food out there.” Direct sales — from farms, farmers’ markets, roadside stands, in Community Supported Agriculture shares, and at pick-your-own operations — have grown 8 percent in the state since 2007, according to Mahler. The number of CSAs and farmers’ markets here have more than doubled in the last 10 years, and with them the supply of local and organic food. One of the newer producer-to-consumer innovations is Farmers to You, run out of Montpelier by onetime farmer Greg Georgakalis and his wife, Eva Cahill. The way it works is that you commit to placing an order of at least $40 for foods grown or produced on about 50 farms in Vermont, New Hampshire, Maine, and New York. The Farmers to You website lists the products of these “partner-farmers,” as they are called. Customers shop from the 250-odd items, which include fruits, beans, vegetables, buttermilk, eggs, meat, jams, bread, syrups, and more. Orders are delivered weekly to 16 Boston-area dropoff spots, or for an extra fee, delivered to your door. Since it began 4½ years ago, the operation’s partner families have grown from 50 to 750, which makes Georgakalis’s goal of 2,000 families “well on the way,” he says. He estimates that currently about 15 percent of his customers rely on FTY and other direct sales from farmers for nearly all of their groceries. 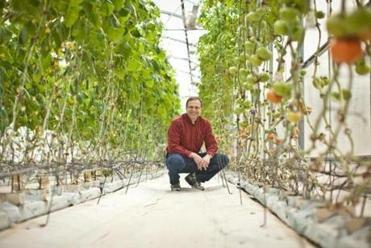 At Water Fresh Farm in Hopkinton, plants can be grown indoors using a hydroponic method. Site host Liz McNerny and driver M. Murphy at Farmers to You pickup location in Cambridge. 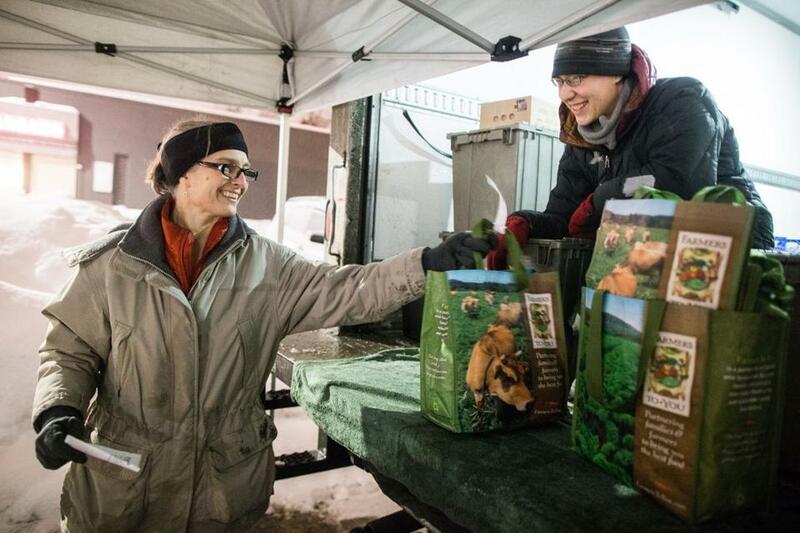 Joe Wright and Jennifer Stevens of Cambridge first joined Farmers to You for the convenience, bowing out of supermarket crowds in favor of picking up their grocery order from a neighbor’s home. “We’ve stuck with it because the food is really good, and we like the idea of supporting individual farmers,” says Wright. He and Moran both think the cost of FTY food is comparable to Whole Foods, but the payoff to farmers is higher. Georgakalis says that farmers get about 60 cents on the dollar from FTY sales, compared with 19 cents on the dollar from supermarkets. “A lot of the things that motivated us are practical things, but I definitely feel like agriculture should be configured differently than it is,” says Wright, a doctor who’s interested in health care and nutrition for lower-income families. “The idea that people are trying different models and trying to support small producers is a step in the right direction. “We have the luxury of supporting an experiment in a different way of doing agriculture and food supply,” he says. He would like to see the program become a model for small producers and family farms to get food to cities or towns. Lucia Huntington can be reached at lucia.huntington9@gmail.com.